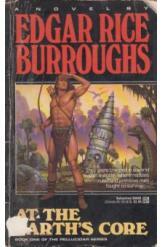 At the Earth's Core by Edgar Rice Burroughs, Sci Fi. Book is in good condition, all pages intact. Deep beneath the Earth's crust, explorers David Innes and Abner Perry discover the hollow world of Pellucidar. When Innes falls in love with the native queen Dian the Beautiful, he finds he must help free her people from the sinister masters of the hollow earth. Book one of Pellucidar series.